Just as the name implies, Service Based Groups were designed to offer fellowship and community within the framework of helping others within and outside of the church. These groups provide the opportunity to meet others in the church while serving others. “They were responsible for the care of the ark, the table, the lampstand, the altars, the articles of the sanctuary used in ministering, the curtain, and everything related to their use.” – Numbers 3:31 The Altar Guild is a special group of men and women called by God to glorify God through taking care of the altar and preparing the sanctuary for services. The Altar Guild is a ministry…a calling. It is a quiet, devoted, reverent ministry to prepare the sanctuary as we all worship the Risen Christ. Anyone who is interested is invited to join the Guild and share in this quiet ministry. Do you have a little bit of “pent-up” creativity? Feel like expressing the “artist” inside? 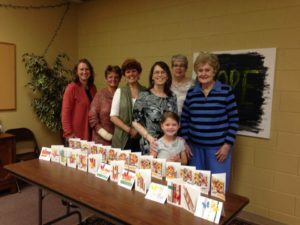 The card crafting group makes cards for those in church who are not able to come to church or who need a special note of encouragement. Is God calling you participate in the Sunday morning prayer-team ministry? Each team meets about once a month for a few minutes in the Prayer Chapel after each worship service. This group prays for all of the prayer requests that have come in regularly, and is available for anyone who might come for prayer. We particularly need people who can pray after the 11 a.m. service. This group meets once a week to pray together and create handmade Prayer Shawls, Blankets, Infant Hats/Blankets, or Teddy Bears for those with medical or spiritual needs. It is a blessing to both the maker and the receiver of these gifts.